The RaceQuip Snell SA-2010 Rated Open Face helmet is an all new design that incorporates prepreg construction based on steel tooling. In this process, the optimum ratio of resin is impregnated into the composite fabric (a combination of carbon fiber, kevlar, and FRP) prior to moulding. Next, the prepreg is forced into the steel mould using a pressurized head form, then heat cured to precise thermal specifications. This manufacturing technique eliminates excess resin weight and ensures uniform shell thickness while leaving the outer surface smooth and blemish free. 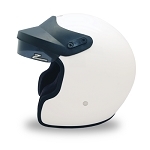 The shell is then mated to an expanded polystyrene (EPS) liner to create a modern lightweight helmet design. If you race in a closed cockpit vehicle and like the feel of an open face helmet, this is the model for you. 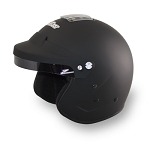 The RaceQuip SA-2010 Open Face helmet features a lightweight composite shell designed specifically for motorsports use. A wide eyeport provides good peripheral vision and allows the use of personal eyewear or goggles. A sun visor with a tinted strip comes standard. 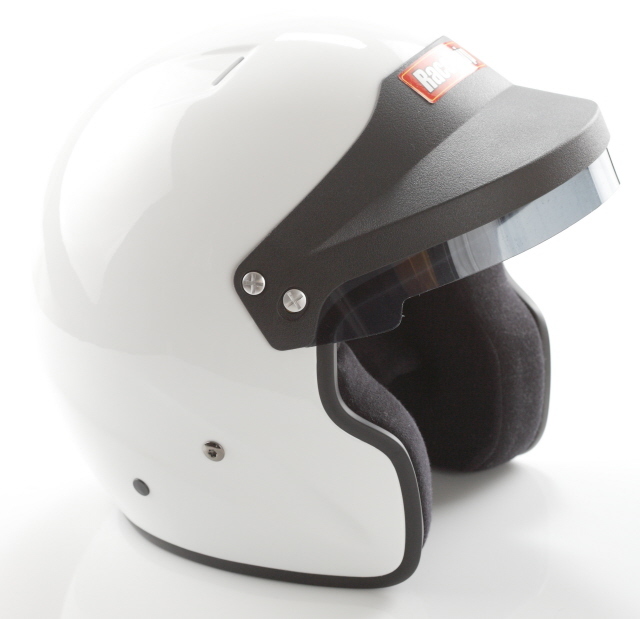 Of course both the interior and paint are fire retardant so the RaceQuip SA-2010 Open Face Helmet is suitable for use in all forms of auto racing. 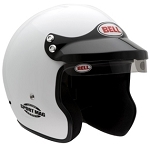 The helmet utilizes a Kevlar® chin strap for strength, a comfort fit blended Nomex® interior for a great feel, and exhaust vents on the top of the shell to help keep a cool head. All these features are wrapped in a lightweight composite shell and the result is the outstanding value delivered by the RaceQuip SA-2010 Open Face helmet.